SCOTCH WHISKY exports slipped again in 2015, writes Leon Kuebler for WhiskyInvestDirect, extending the previous year's drop with a decline of 2.6% by value. But within the 2015 export figures – released this month by HMRC, and first reported here – the industry should find several reasons for optimism. 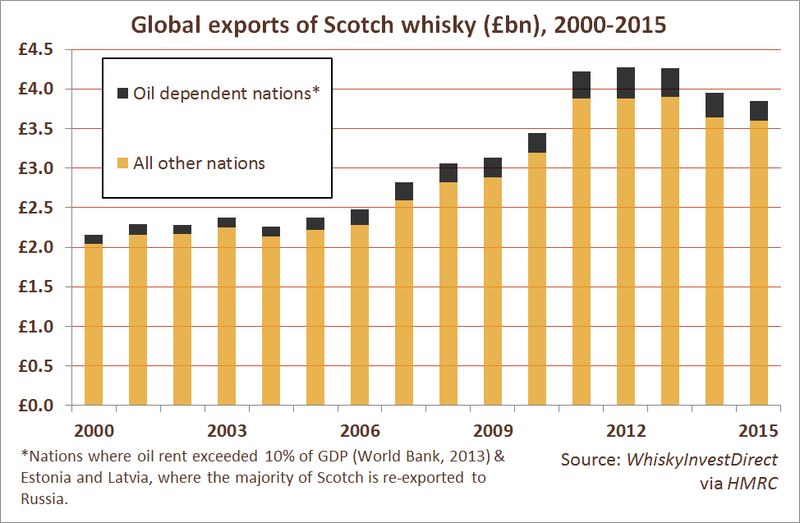 Firstly, the drop in exports of Scotch whisky does not reflect changing tastes around the world, but three specific factors: EU sanctions on Russia, falling oil prices, and recession in Brazil. The Scotch whisky industry is far from alone in feeling the effects of falling oil prices: few industries have escaped. Nevertheless, rising oil prices have consistently led in the past to an increase in exports of Scotch whisky to oil-dependent economies. There is no reason, as yet, to doubt that demand should recover in these markets when energy prices stabilise or pick up. Rising oil prices since the beginning of the 21st century helped grow the value of Scotch whisky exports to energy-producer states. But the industry certainly hasn't depended on it. Indeed, exports to oil-dependent nations have only formed a small fraction of the total worldwide market, even when Brent Crude exceeded $100 per barrel. 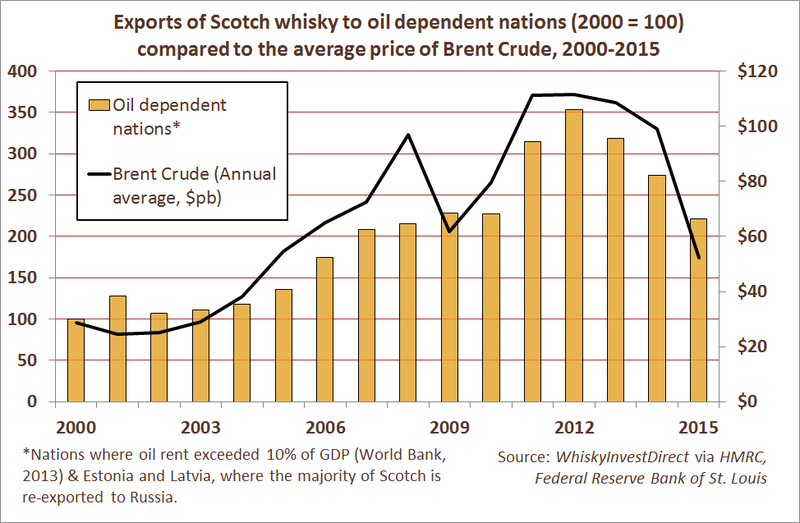 If you take oil-dependent nations out of the equation (along with Estonia and Latvia, where most Russian imports of Scotch are first sent), the value of overseas sales of Scotch whisky only declined by 1.2% in 2015. The sharp drop of 2014 was also slightly better when you exclude the impact of oil-dependent buyers, down 6.7% against the 7.3% drop worldwide. Exports the previous year, 2013, actually rose 0.7% outside oil-dependent nations – suggesting that the small overall decline of 0.3% that year, the first in over a decade, was due to the small dip in oil prices at that time, rather than any underlying change in global tastes. Putting oil-dependent markets back into the data, Scotch whisky's long-term export growth still looks solid. Seen over the last two decades, it has proven to be a remarkably resilient consumer good across all global regions. Scotch whisky is a luxury product, and it is not immune to major economic shocks. Yet growth over the last 20 years has continued despite the Asian Crisis of 1997-1998, the Tech Stock Crash of 2001, and the global financial crash of 2007-2009. Today, 27 national markets import over half-a-million cases each year – nearly double the 14 doing so in 1985. In 2000, the European Union accounted for 45.2% of Scotch exports by volume and 39.9% by value; in 2015 those figures were 37.5% and 31% respectively, as exports outside of the European Community grew in significance while the value of EU sales also rose. This is despite the fact that thirteen states have joined the EU since the turn of the 21st century. Eleven of the new EU member states were formerly categorised under non-EU Eastern Europe; along from Russia’s recent difficulties, this explains why, over the last 20 years, this region alone has shrunk in absolute value terms. The major success story of 2015 was North America, where exports of Scotch rose by 3% overall compared to 2014 in value terms. Demand in the United States, which accounts for 19% of worldwide Scotch exports, remained constant, while exports to Canada and Mexico increased by a combined £27m. Mexico has in fact become a key emerging market for Scotch, with exports increasing by 444% in value since 2007, registering double-digit growth in all but two years in the process. The rise in popularity of Scotch in Mexico has come at the expense of lower-quality spirits, as young adults looking for high-quality products change the landscape of alcoholic beverage sales. 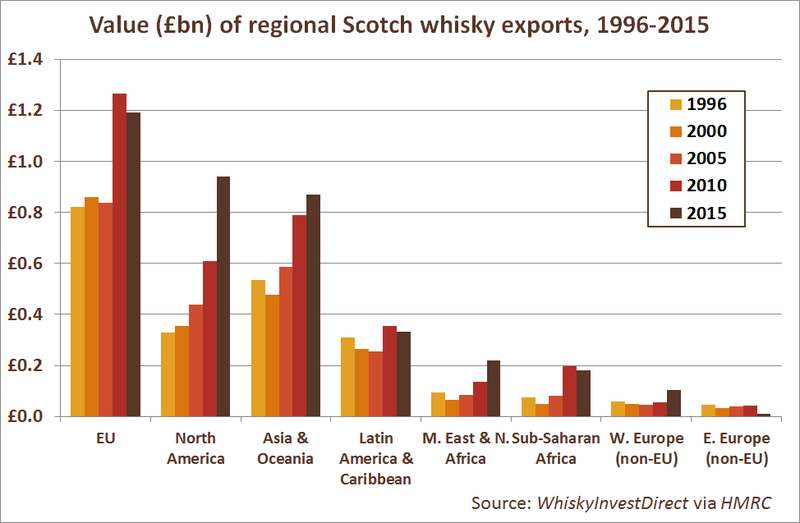 Many Latin American and Caribbean countries have also seen imports of Scotch whisky rise in recent years. If we exclude Brazil and Venezuela (both of which are currently undergoing acute economic difficulties), exports to this region increased by £9.2m in 2015 – an increase of 3.4%. Scotch has been growing in popularity among the young middle class across the region, with brands such as Pernod Ricard's Passport rising by over 30% in Brazil and Mexico. Perhaps most encouragingly, exports to mainland China and the three neighbouring markets serving as local hubs for its whisky imports (Hong Kong, Macao and Singapore) increased by 3% overall in 2015. In doing so, Scotch exports fared better than many other commodities imported by China as its formerly break-neck GDP growth slowed further. Exports to Japan also rose in 2015, up by 18% with an increase of £11m. Japan was the 5th largest market for Scotch in 2000, but eight consecutive years of declining imports saw it shrink to 20th place by 2008. Last year, Japan reached 13th place in the global league table of Scotch importers, with exports increasing in five of the last seven years. Finally, while the Eastern European region has seen a steep decline in Scotch imports in recent years, the same cannot be said about those former Eastern European nations that have joined the EU. Bulgaria and Poland provide clear examples. 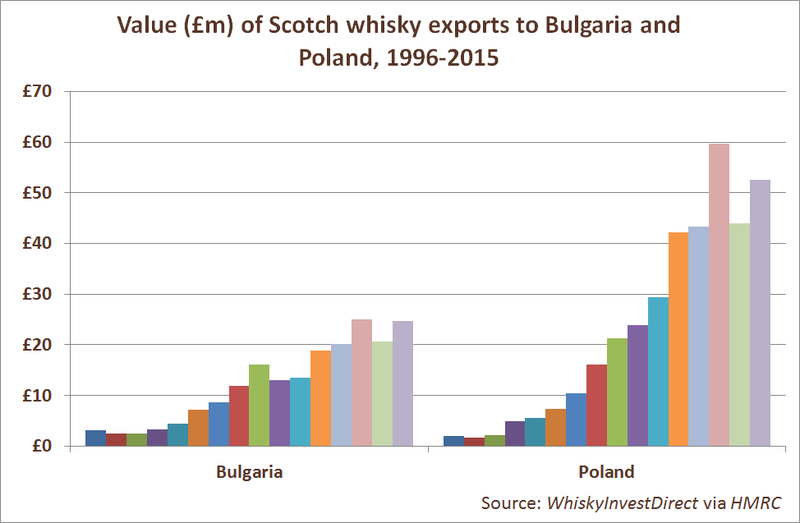 Poland was in 2005 the 42nd largest market for Scotch and Bulgaria the 44th; last year, Poland was the 18th largest market for Scotch, with Bulgaria the 33rd. In each case, it would appear, as the Scotch Whisky Association argue, that the single market has proven beneficial for the whisky industry as a whole. Poland joined the EU in 2004, while Bulgaria acceded three years later, in 2007. Since joining the EU, each country has seen its imports of Scotch whisky increase by a compound average of 21.8% and 12.5% respectively each year. In short, the underlying growth in value of Scotch whisky exports has not depended on the performance of any one country or region. This stands in sharp contrast to many commodities, such as copper, and other spirits, like Russian vodka. Instead – and oil shock or not – Scotch whisky has, to date, found its export markets protected by a broad and growing base of consumers worldwide.